Quantifying the American mood through opinion polls appears to be an unbiased means for finding out what people want. But in Numbered Voices, Susan Herbst demonstrates that the way public opinion is measured affects the use that voters, legislators, and journalists make of it. Exploring the history of public opinion in the United States from the mid-nineteenth century to the present day, Herbst shows how numbers served both instrumental and symbolic functions, not only conveying neutral information but creating a basis authority. Addressing how the quantification of public opinion has affected contemporary politics and the democratic process, Herbst asks difficult but fundamental questions about the workings of American politics. How are numbers generated by public opinion surveys used to describe the national mood? Why have they gained such widespread respect and power in American life? Do polls enhance democracy, or simply accelerate the erosion of public discourse? Quantifying the American mood through opinion polls has come to seem an unbiased means for assessing what people want. 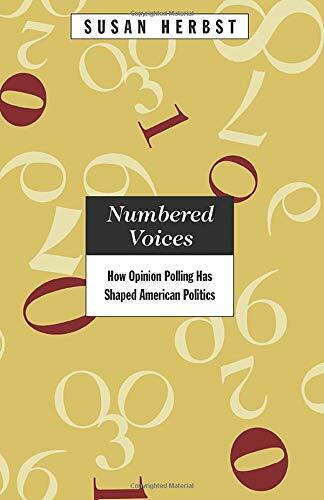 But in Numbered Voices Susan Herbst demonstrates that how public opinion is measured affects the ways that voters, legislators, and journalists conceive of it. Exploring the history of public opinion in the United States from the mid-nineteenth century to the present day, Herbst analyzes how quantitative descriptions of public opinion became so authoritative. She shows how numbers served instrumental functions, but symbolic ones as well: public opinion figures convey authority and not only neutral information. Case studies and numerous examples illustrate how and why quantitative public opinion data have been so critical during and between American elections. Herbst then addresses how the quantification of public opinion has affected contemporary politics, and its implications for the democratic process. She shows that opinion polling is attractive because of its scientific aura, but that surveys do not necessarily enhance public debate. On the contrary, Herbst argues, polling often causes us to ignore certain dimensions of public problems by narrowing the bounds of public debate. By scrutinizing the role of opinion polling in the United States, Numbered Voices forces us to ask difficult but fundamental questions about American politics - questions with important implications for the democratic process.